Key business locations in Rotherham have been confirmed as areas that stand to benefit from a multimillion project to ensure 97.9% of South Yorkshire will have access to superfast broadband by the end of 2017. Contracts were signed for a £22m project last year, developed by a partnership with the leadership of the four partners' authorities in South Yorkshire, alongside the support of the Sheffield City Region Local Enterprise Partnership (LEP). 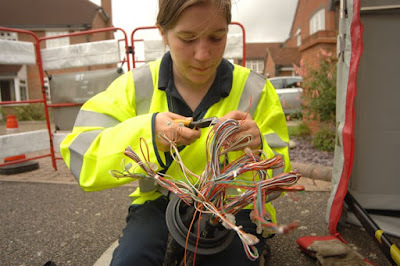 It is part of the government's BDUK initiative which is based on a gap funded subsidy approach, where the private sector invests alongside a public subsidy to provide broadband to areas where there is not otherwise a viable commercial market. With further funding available by BDUK, project bosses agreed that it should be added to and used to support a proposal specifically for the South Yorkshire Enterprise Zones and key strategic business parks. More than 30 business parks and Enterprise Zones in South Yorkshire, including Dinnington, Hellaby Industrial Estate, Dearne Valley and Gateway Industrial Park, are set to be upgraded to fibre-to-the-premises (FTTP) technology - providing ultrafast broadband speeds of up to 300Mbps - thanks to the multi-million pound Superfast South Yorkshire programme. Natalie Ward, programme manager for Superfast South Yorkshire, said: "We understand the needs of local businesses and for several months we have been working to secure additional funding of £4.8 million to ensure that business parks and Enterprise Zones throughout South Yorkshire can benefit from ultrafast broadband. This additional work will have the knock-on effect of extending the reach of fibre broadband to 99 percent of South Yorkshire which is also fantastic news. "Businesses are the engine room that power local economies so we have worked hard to make this happen. Faster broadband breaks down the barriers to doing business in the digital world like online trading, which helps to empower small businesses to find new markets, sell new products, try new business models and compete on an equal footing with larger businesses, not just in the UK but globally." One business set to benefit is engineering company, Rope and Sling Specialists (RSS) Ltd which is based at the Centurion Business Park in Rotherham and supplies lifting and height safety equipment mainly for the construction industry. Angela Holmes, company accountant, said that the business sees ultrafast broadband as a key to their future growth. She said: "We need good broadband connection speeds to ensure that our customers can access our web-shop, place orders, make payments and access their invoices. For us, ultrafast is a must have technology." More than 476,000 households and businesses in South Yorkshire now have access to high-speed fibre broadband as a result of Superfast South Yorkshire and BT's own commercial fibre broadband programme.